Many of our favorite wild foods seem to appear all at once in the early spring, which can make it hard to appreciate each one adequately. A practical way to enjoy the season’s abundance is to combine several of them together into a single dish. Another is to preserve the fresh flavors of the spring wild harvest so they can be enjoyed all year round. This dish does both. The flavor and texture of the morel is well known and these unique, honeycomb-shaped mushrooms frequently steal the show in any dish in which they appear. But the real star of this simple recipe is the ramp (Allium tricoccum), also known as the wild leek. 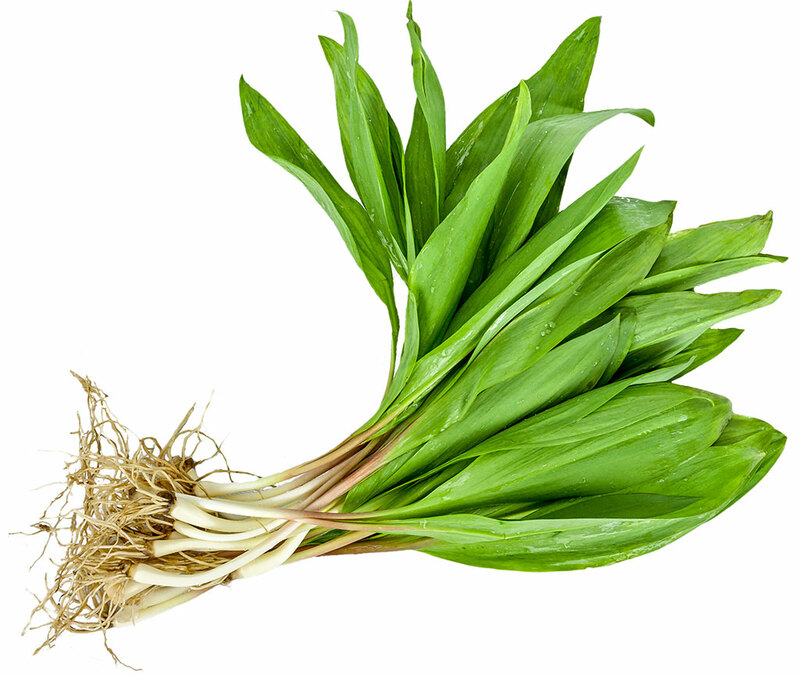 Ramps, one of Eastern North America’s first wild foods to appear each spring, quickly grow from tiny shoots to lush green-topped mature plants, and finally to fat, onion-like bulbs – all within the span of a few short weeks. The old-time country folks who often depended on wild foods for survival found many ways to preserve ramps; in the earliest days before electricity, by drying or pickling, then later, by freezing. Those time-tested methods still work, but one of our favorite ways to preserve ramps is in the form of ramp butter. After a quick dip in boiling water (which helps to take the edge off their raw garlicky bite), ramps are pureed into creamy sweet butter, then rolled into thick logs to chill, locking in that unmistakable wild taste, until it’s released in a warm, melting flood of flavor. 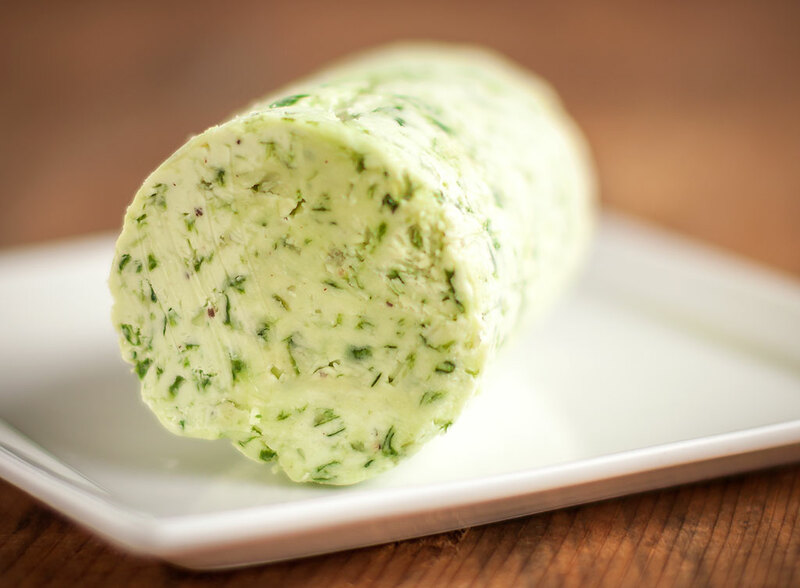 Once made, ramp butter will keep for several weeks if kept tightly wrapped and refrigerated, but when kept frozen, ramp butter can be stored with no loss of flavor or quality for many, many months. …but it’s mostly about the ramps. For those who love the wild flavors of two spring companions, morel mushrooms and ramps, this is comfort food at its very best. It’s even easier if you already have the ramp butter made in advance and ready to go. 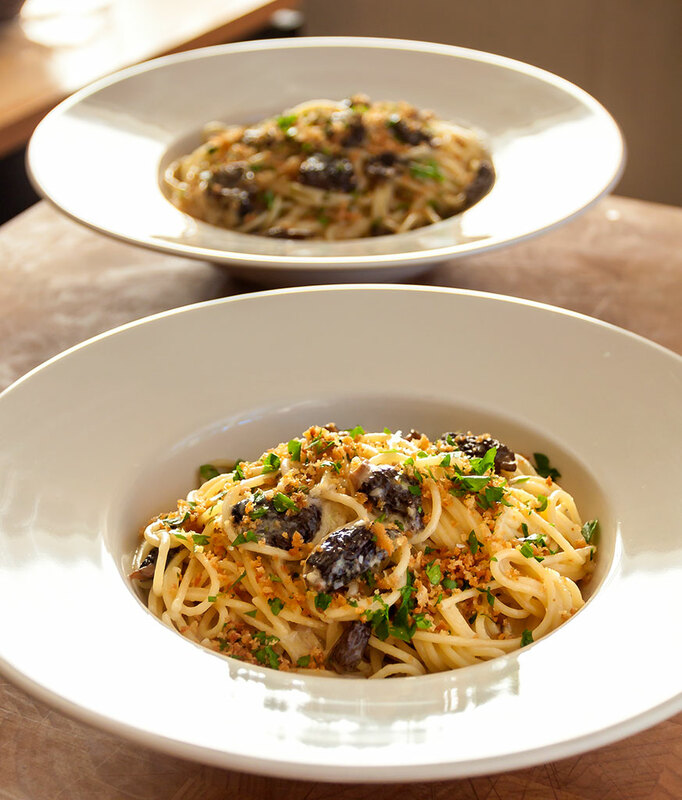 We love twirling long strands of spaghetti, but any pasta will do. You might be tempted to skip the toasted bread crumbs, but please don’t. The crispy crunch and warm, toasty-nutty flavor adds so much appeal that it would be an altogether different dish without them. 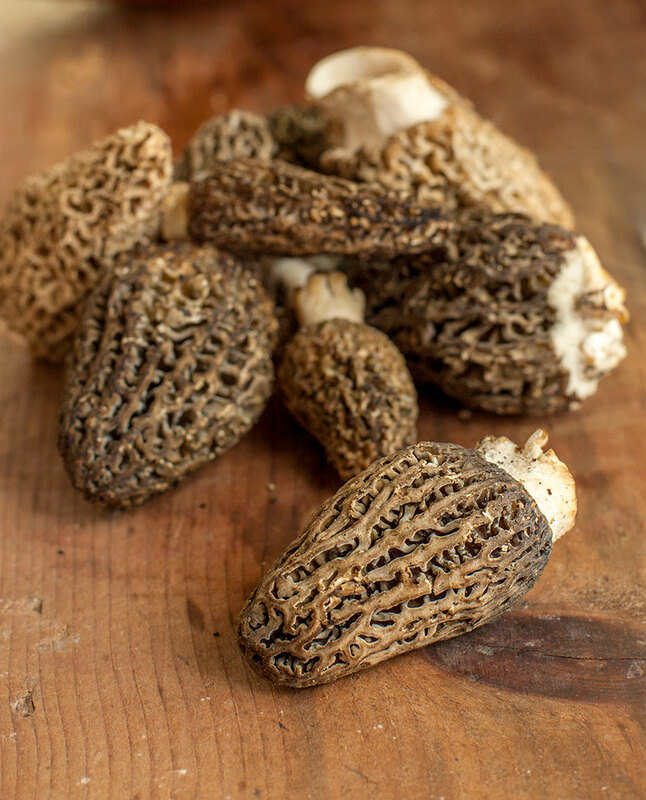 If using fresh morels, clean them by immersing them in cold salted water for 15 – 20 minutes. This will help to remove any dirt or forest debris from the honeycomb-like body of the mushrooms, and will also “encourage” any insect hitchhikers to vacate the premises. Lift the morels into a colander and gently rinse under cool running water. Lay out on a clean kitchen towel to drain completely. Morels pan-fried in butter. What’s not to like? 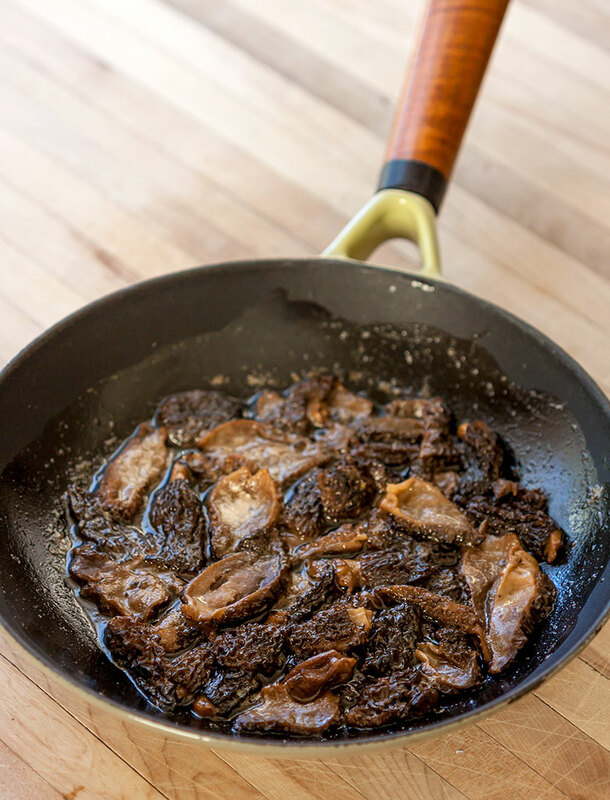 If using dried morels, soak them in warm water for 20 – 30 minutes or until soft and pliable. Drain, reserving the soaking liquid for use in soups or sauces. Rinse the rehydrated morels under cool running water to remove any remaining grit and forest debris. Drain thoroughly before proceeding to the next step. Slice the morels lengthwise into halves or quarters, depending on size. Melt the 2 Tablespoons of butter in a large skillet over medium high heat. When it begins to bubble, add the morels. Cook until the morels have released their liquid and most of it has evaporated, about 10 minutes. Remove from the heat and set aside. Cook the pasta according to instructions, then drain, reserving 1 cup of the pasta cooking water. Return the pasta to the pot along with 1/2 cup of the reserved cooking water, the ramp butter and the morels, along with their butter and juices, and cook over moderate heat until most of the liquid has been absorbed, about one to two minutes. If the pasta seems too dry, add more of the reserved cooking liquid. 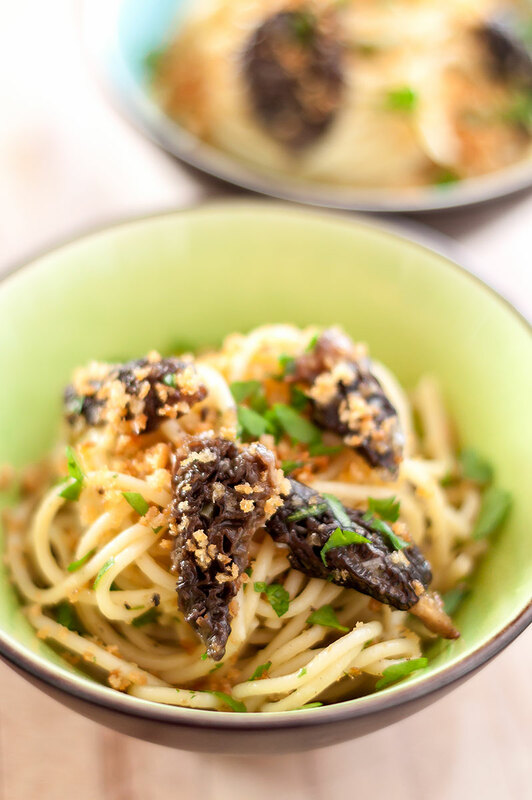 Divide the pasta and morels between serving plates and top generously with grated parmesan cheese, crisp toasted bread crumbs and fresh parsley. Melt the butter in a skillet over medium heat. Add the panko or bread crumbs, stirring to coat evenly with the butter. Stir and shake the pan continuously until the crumbs are golden brown, 5 to 10 minutes. Remove from the heat and add salt to taste. Store any unused toasted crumbs in a tightly sealed container.